Do you remember Betsy McCall paper dolls? 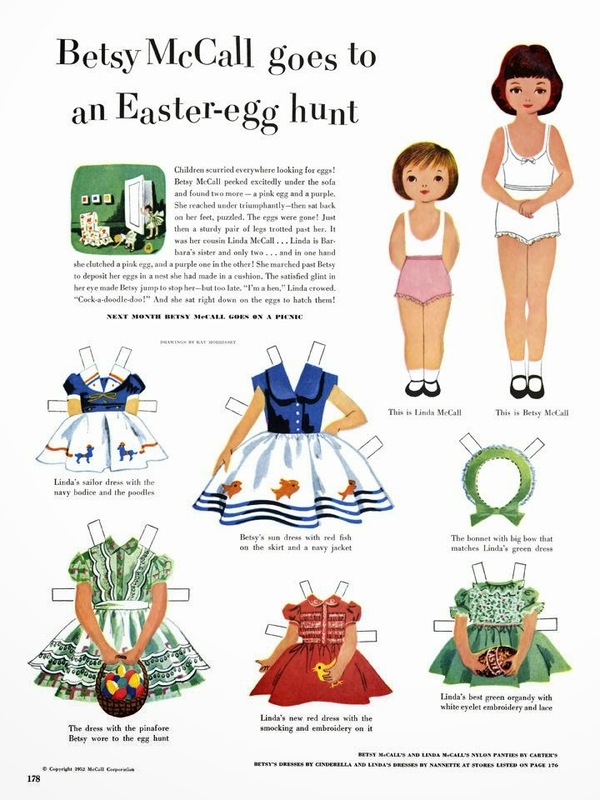 When I was growing up, McCall's magazine featured a paper doll page in every issue. The paper doll was Betsy McCall, a little girl who had everyday experiences like Girl Scouts, painting, making Valentines, decorating for Christmas, and more. Betsy had a little Dachshund dog named Nosy. As a lifelong "dachshund person," of course I love the Nosy paper dolls most of all. I used to cut these paper dolls out and play with them. Since they were on magazine paper (thin), I sometimes mounted them on cardboard. 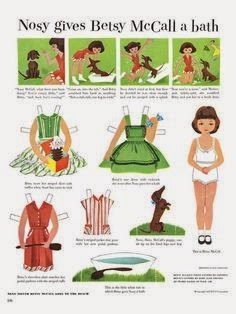 I purchased a few McCall's magazines not long ago, and plan to frame the paper doll pages for my study. 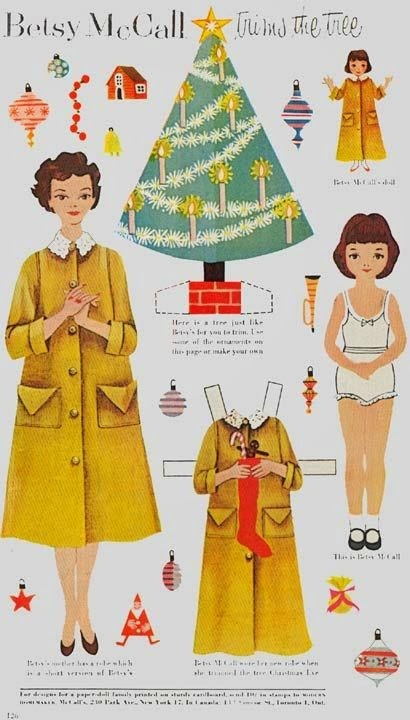 Do you remember Betsy McCall paper dolls? Did you play with any other paper dolls as a child? I would love to hear from you in the comments, below. I remember these things when I was a kid! I remember this stuff from when I was a kid. Well done! I loved paper dolls when I was little!! I think they used to sell them at the grocery store right beside the check out....not the best place for parents but I loved them!! I DO remember paper dolls and am familiar with McCalls but not sure those are the one's I played with. My how much simpler life was back then. I was happy to play with paper dolls. The worst thing that could happen would be for the tab to finally break on an article of 'clothing' for one of my paper dolls. Fun memories! I remember playing with paper dolls when I was little. Not nearly as much fun as regular dolls, but it was fun making and coloring new clothes. I loved paper dolls when I was a kid. My grandmother subscribed to McCall's and I always looked forward to the Betsy McCall pages that she'd save for when I was visiting. Great memory, and great idea to frame these for your study! Thanks for the comments! I enjoyed reading your paper doll memories. I loved the traditional paper doll books too (the kind that were sold at dimestores, etc.). Oh yes I remember these! Love them. That's a really cute idea to frame them. We need to bring more of these things back for little girls of today. I did play with paper dolls, a lot, I think although I don't really remember which ones I owned. Maybe Barbie paper dolls? Great idea to frame them for your study, Trish. Brenda, I had a set of Barbie paper dolls -- loved those as a little girl!